Beautiful set of 4 picture frames. They are made from hand woven rattan and bamboo frame. Each frame can be displayed as horizontal or portrait orientation. 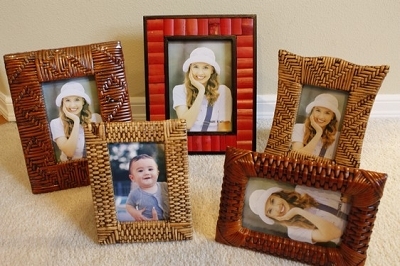 One Wavy Edge rattan frame for photo size: 3.5" x 5". Two rattan frames for photo size: 4" x 6". One bamboo frame for photo size: 5" x 7". Always best deal to but as a set. However individual frame is also available. The smallest frame shown on photo have been sold out.